1. Rinse quinoa well, add stock, bay leaf and cook it just like rice either in a saucepan or in a rice cooker. Once cooked, stir to fluff it up and place in a plate to cool it down. 2. Mix together curry paste, coconut milk, salt and chili powder. Pour over chicken thighs, mix well and set aside to marinate for about an hour while preparing other ingredients. 3. Pan-fry chicken in a tablespoon of coconut oil for 6-8 minutes turning occasionally until fully cooked and slightly charred on both sides. Set aside to cool. Chop into bite-size pieces. 4. Peel green mango and carrots, then scrape into thin, long strips using a zig-zag peeler. 5. Place carrots, halved cherry tomatoes, mango, mint/basil leaves and quinoa in a large bowl. Add chopped chicken along with leftover juices into the bowl. Refrigerate. 6. Whisk together lemon juice, olive oil, fish sauce, chili and honey to make salad dressing. 7. 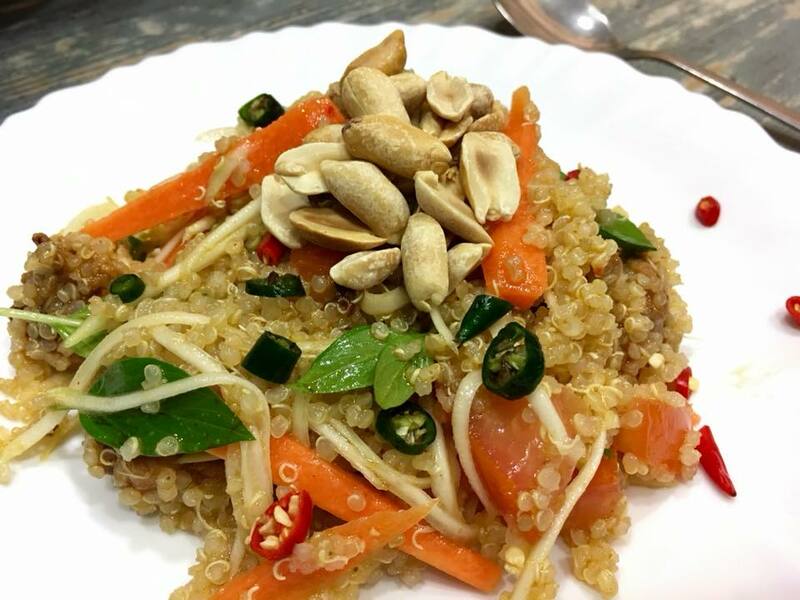 Pour salad dressing over prepared quinoa, chicken and vegetables, serve chilled garnished with peanuts or crispy shallots. Note: Pour dressing just before serving.